This release presents music associated with the Renaissance master Josquin Des Prez, a composer who towers above all others in the first part of the sixteenth century. 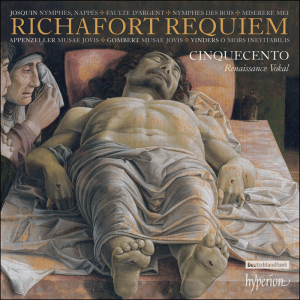 Numerous works were attributed to him that have now been proven to be by his contemporaries and successors, including the central work on this recording, Jean Richafort’s expansive and beautiful Requiem. It is performed with affecting clarity by the all-male vocal group Cinquecento, whose many previous discs of Renaissance repertoire for Hyperion have garnered the highest critical praise. Booklet notes by Stephen Rice, an acknowledged authority on this repertoire, place the music in its historical context and unpick the mysteries of its composition.